Minimal additional efforts are needed to complete this active antenna project. 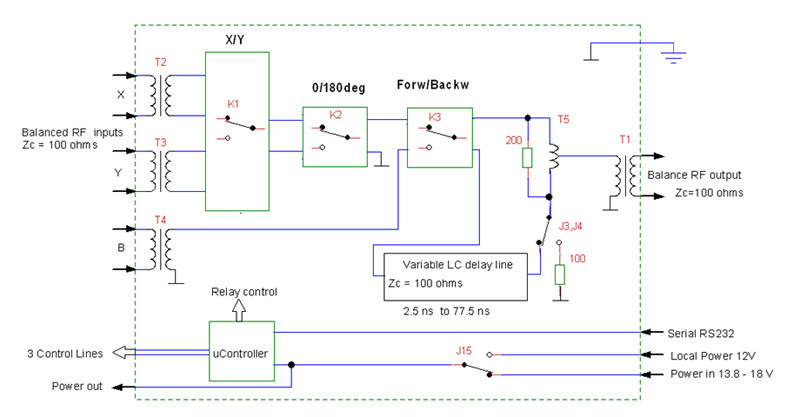 For more details look at the Variable Delay Line Technical Section. Full control of switch microcontroller via serial interface. Serial control codes are available. This Variable Delay Line kit can be used to build 2–element wideband receiving phased array with closely spaced active antenna elements. The voltages from the two elements are subtracted but the signal from one the elements is delayed with certain value in order to achieve unidirectional pattern. The distance between elements can be determined by the user according to available space and then the variable delay can be set to the optimal value for this distance. The delay setting does not depend from the frequency – it depends only from the distance D between elements thus the array is wideband. Switching of the array elements permits to have 4 directions in subtractive mode. There is also additive mode which is almost unidirectional. It is strongly recommended to read the paper “Receiving Phased Array with Small Electric or Magnetic Active Wideband Elements. Experimental Performance Evaluation.” , where the principle of operation and important parameters of the 2-element phased array are measured and discussed. The suggested frequency range is form 0.5 to 14 MHz (without any switching) but there is possibility to add one additional delay cell with arbitrary delay so the frequency range can be extended. In order to build 4-directional 2-element array the user must have 3 active antennas placed in L shape. AAA-1 active antenna amplifiers can be used and the firmware is designed to support the AAA-1 devices, but the user can use also active antennas from other vendor or home build devices. Only two active elements can be used if two opposite directions are needed. The variable delay line (VDLine) board is placed near the active antennas and is remotely controlled. The active antennas must be connected to this module with equal lengths cables for the RF signal. FTP cables are recommended to be used. The device consists of 3 SMD pre-mounted, tested and fully functional PCBs. VDLine board is placed in a small ABS plastic box (IP55) for external mount in the vicinity of the active antennas. There are also Keyboard board (KB) and Balun/Power injector board (BPI) which are mounted in the shack. 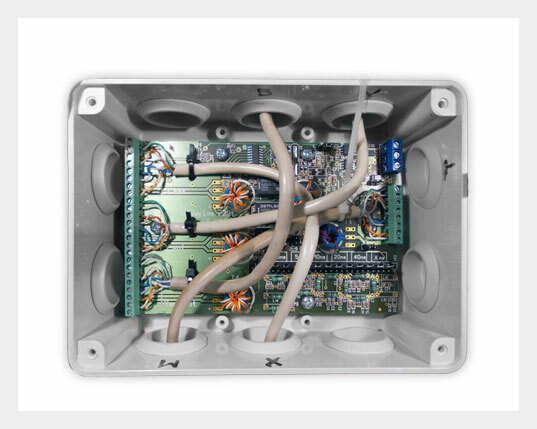 The KB and BPI boards are supplied as is and the user must put them into suitable compartments. The KB board firmware is preprogrammed to use AAA-1 active antenna amplifiers but the same firmware can be used by the user with other active antenna hardware. It is possible to use unique dual antenna mode with AAA-1 amplifiers. That means that with the same antenna setup we can switch between phased array in loop mode and phased array in vertical dipole mode since they are using the same settings of the delay line. These two arrays have different radiation pattern especially in elevation so the user have also elevation control to some extent. The user should have to build his own small antennas (loops and dipoles) as described elsewhere, to secure a 14 – 20 V power supply and prepare 3 equal length FTP cables to connect 3 AAA-1 amplifiers to the VDLine module and one main FTP cable between VDLine module and BPI board. The connection of the cables to the boards is through terminal blocks (with screws) and there is no crimping of plugs. The device is very flexible and there is sufficient information in this site how to build a specific array with antennas and parameters even different from the original design. It is possible to change the input and output impedances of this device to other values ( 50 or 75 ohms) by simple change and rewinding of the corresponding transformers. It is possible to use coaxial cable feeders instead of the FTP cables etc. The serial interface codes are given so the user can write his own control sequence software and to control the switching from PC. This is not a beginners project and the user should have to understand the principles of the phased antennas in order to build a successive antenna system. The VDline kit should be considered as an universal building block for phased array systems and the competent user can use it for various experiments and designs of his own. The total current price of the kit including any other material which can be downloaded from this site is shown in shopping cart . Each kit content is clearly described in the product description section of this site. Remark 1: The total price of the Product is formed from the following components: 50% part for the hardware (which is physically send and this price is declared in the parcel) and 50% part for the documentation (including software if such exists) which can be downloaded from this site. The hardware, documentation and software are inseparable parts. Remark 2: Bulgaria is a member of the European Union and there are no additional taxes for EU members since we are not VAT registered. Domestic taxes for the rest of the world (if they exist) are the entire responsibility of the customer. We are not a company with paid personnel and for the moment there is no VAT registration. Invoices are included upon request. The orders with payment (kit total price plus delivery expenses, no additional Pay Pal fees) should be performed via Pay Pal system through “Add to Cart” button. There is no price discount when buying multiple kits and they will be sent as separate packages each with the corresponding shipping prices. The reason is that we are sending kits as a “small parcel”. When the weight and price increase above certain limits the “normal parcel” category must be used which is more expensive since the minimal price is for 2 kg weight. There are also customs alleviations (for non EU countries) when the price of the parcel is below certain limits. If you want to use other ways of delivery or to send all items into a single parcel you should send an email to info@active-antenna.eu and wait for the confirmation from us. Usually in this case we will send a Pay Pal invoice for the due payment. If you want to use other ways of payment (e.g. bank transfer) we will send you a proforma invoice. For multiple kits orders we will send each kit as a separate parcel. This is the standard international post-office service. The parcel usually needs between 5 and 15 days to arrive for Europe. After the dispatch we will send the parcel tracking number by an email. We can track only that the parcel has left Bulgaria. Check at http://www.track-trace.com and enter at Post/EMS field your tracking number. The message “Insert item into bag (Otb) ” means that the parcel is ready to be loaded on the airplane to certain destination. This is the last message (with date and time) from this web site. Our commitment for the shipping ends at this point. In some countries the incoming parcel can also be tracked on the website of the National Postal organization so the next step is to check at your national post site for the arrival. All expenses due to any problem with the post office service after the parcel has left Bulgaria are to the customer. In the case of lost parcel we will provide you with proof that the parcel was delivered and with the tracking number that it has left the country – otherwise we will send another kit. There will be no official commitment by us for lost, damaged or delayed parcels after the parcel has left Bulgaria but in any case we will try to solve such problems in informal ham spirit style. If someone wishes to use courier service that can be negotiated with emails to info@active-antenna.eu. Currently the orders are dispatched from our office within 5 working days. The return of a functional kit is not possible. In the case of malfunction due to a production defect the customer should inform us with an email to info@active-antenna.eu with a brief description of the defect. If the case is a production defect the kit can be returned at the address specified in our confirmation email. The cost of the return shipping of the repaired kit will be at our expenses. The above will be possible within 90 days after the day of the payment. We believe that 3 months is a sufficient period for the most of the production defects (if there are any) to manifest themselves. We are not specifying the usual commercial guarantee period since we are not a company with paid personnel. The kits are low priced and it is difficult for us to give to the customers the usual commercial guarantees. This limited guarantee does not apply to the kits which are visually damaged or repaired by the customer. We will do our best to solve all arising problems in informal ham spirit style. The Active Antenna Amplifier and Variable Delay Line kits (referred to as the Products) are not intended for professional use or other responsible applications. They are hobby projects and are intended to be used by the amateur radio society. The specifications data are based only on measurements in the designer’s laboratory and model calculations. They are made on random production samples. The designers and producers of this Product will make all the necessary efforts to ensure that the production fulfills the above mentioned specifications. We do not guarantee that the documentation of these Products is free from unintentional errors. Any damages or losses direct or indirect caused to any third party by using the Products and their documentation are entirely the user’s responsibility. The antenna, the cable and the power supply built or supplied by the user should fulfill the requirements of the respective safety standards and regulations.